Uh…. Its been quite sometime I have been waiting to complete this post . As promised in my Diwali post, bringing you 2 guest posts from my 2 very good friends. I just love their variety n love the simplicity with which they make the food even more yummier. Make a batter of maida, corn flour, red chilly powder and salt using water. Add ginger-garlic paste to the batter. Dip the gobhi florets in the batter and deep fry till golden brown. Keep aside. Heat oil in another pan and add garlic, chopped onions and green chilli to it. Now, mix aginomoto, viniger, soya sauce and tomato sauce to it. Fry till oil seperates. Add fried Gobi kept aside and mix well. Garnish it with spring onions or corriander leaves. Wash, drain the basmathi rice and keep it aside for atleast 30 minutes. Chop vegetables of your choice & keep it aside. I have used Carrots, Beans , Peas, Onions. Either microwave the vegetables or open cook them leaving the onions aside. Chop spring onions finely & keep it aside. In a large pan , add twice the amount of water for the rice measurement. Once the water boils , add the vegetable stock , a pinch of salt and rice. Cook in medium flame. Once the water is nearly about to evaporate , cover the rice pan with a lid and cook for 5- more min in fully low flame. Turn of the gas and allow it cool down a bit. In 2 tsp of Olive Oil , Add Ginger garlic paste . Saute them for about 1 minute . Add Red onions & spring onions and stir them for few minutes until they get translucent. Now add the cooked vegetables and mix them well. Add Soya Sauce & required salt and stir them well. Turn of the gas and keep them aside. Now add the rice to the vegetable mixture and stir well until they are well incorporated. Serve hot with Gobi Manchurian or Raitha. Oh are these the party feast items you had mentioned then ? Oooh!!! Fried rice and gobi manchurian!!! wat an exclnt combo ..both look perfect and yummy!!! Both the dishes look wonderful and nice pictures. lovely combination…i am hungry nw…love to grab those now!! !..yummy and tempting!! Fried Rice and Manchoo – perfect combo! You have a very nice space here – will stop by often! Yummy combo..wat a delicious and tempting dishes ..awesome work dear…Am drooling rite now here!! Gobi Manchurian is a favorite treat at our place, yours have turned out beautifully ! You have a lovely space here…. Both the dishes look fantastic. Awesome combo!A simple recipe with lot of flavors! 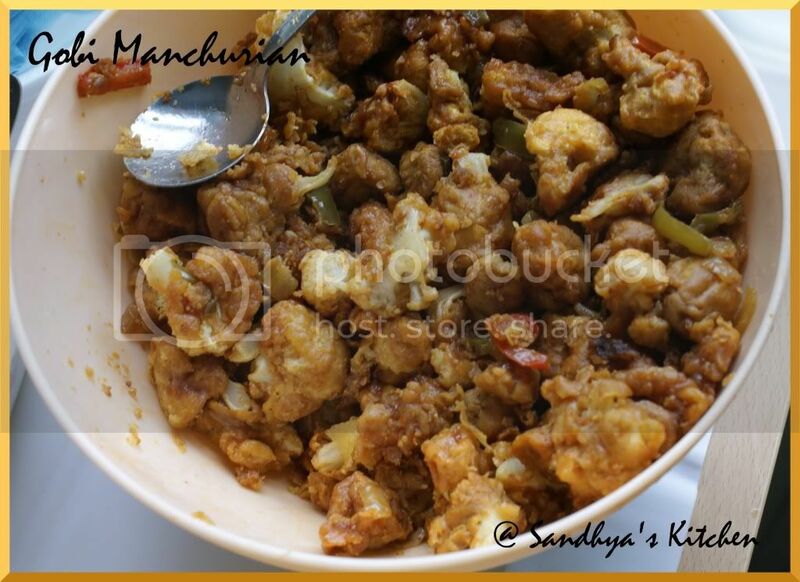 this cauliflower manchurian looks easy and yummy too.fried rice also looks nice.Perfect combo.I have an award waiting for u in my blog. Fantastic meal..fav combi..Rice looks too tempting. Think adding the stock gives that extra taste and all the nutrition! Both were feast to eyes Sandhya. Loved the recipe for manchurian. Am hoping to give it a try soon. have one head cauliflower cut in big florets sitting deeply in my freezer for two days now.High time they come out. Fried rice n gobi manchurian sounds like treat to me . My favorite combo. They look awesome! 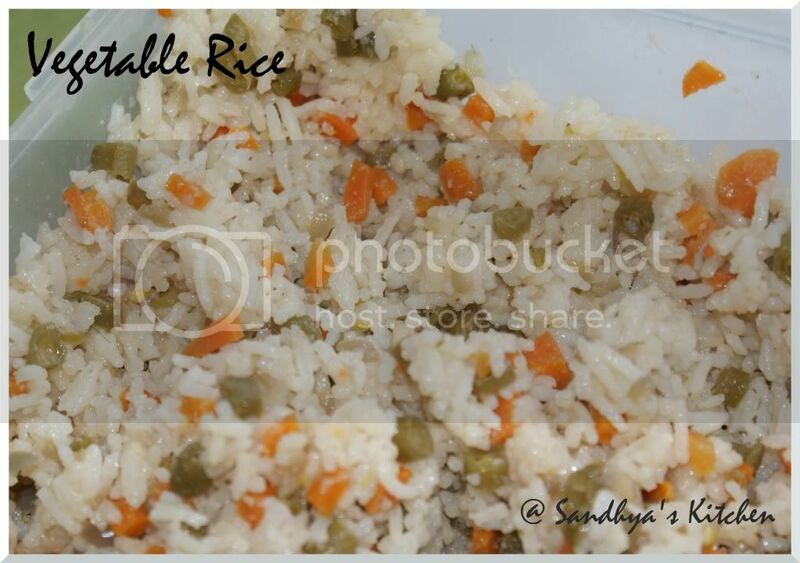 Veg rice and gobi manchrian makes a fab combination!nice clicks too! The gobi manchurian sounds like a great combo with the veggie rice. long since I dropped by your blog. How have u been?